Since the first sighting of the Christmas star, the birth of Jesus has inspired joy, and Christians today likewise commemorate that event by sharing glad tidings with family and friends. But all is not calm and bright for everyone during the Christmas season. Blue Christmas or Longest Night services to coincide with the annual Winter Solstice, the day with the most hours of darkness. It also is the traditional feast day for Saint Thomas, often referred to as "doubting Thomas," who struggled with his faith in Jesus' resurrection. Click here for Longest Night service resources from United Methodist Discipleship Ministries. For Rev. Tom Pope’s grandchildren, for example, it will be the first Christmas spent without their dad, who died last January. “They loved him and they miss him,” said Pope, who earlier this year became pastor at St. Paul’s UMC, Melbourne. That personal experience provided incentive for him to plan a Blue Christmas/Longest Night service this Sunday. It will be his first, as well as the first time St. Paul’s has held one. The congregation’s plans include expanding the idea to include other kinds of loss besides death of a loved one, such as loss of a job, home, relationship or economic security. On the other side of the state, Rev. Sharon Davis, in a new appointment at Manatee UMC, Bradenton, is making plans to lead her first Longest Night service – the third for the congregation. 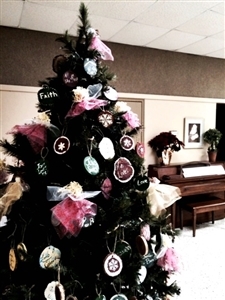 Hand-crafted ornaments from Manatee UMC's women's group will offer comfort to those who attend the church's Blue Christmas service on Sunday, Dec. 21. Photo by Rev. Sharon Davis. The service comes on the heels of a memorial service hosted with a local hospice care group in November and will precede by three days an outdoor Christmas Eve service that typically draws 300 or more people from throughout the community. Like Pope, Davis plans to broaden the definition of loss and grieving to include “people who are struggling with the holidays for any number of reasons,” she said. Both pastors say they will encourage others in the congregation who may not be experiencing loss or sadness to attend the service as a sign of their support. Members of the Manatee UMC women’s group cut and decorated pieces of wood to make tree ornaments that carry words of encouragement. People at the Longest Night service will be encouraged to choose one to keep. “They say things like ‘hope,’ ‘love’ and ‘amazing grace,’” Davis explained. The service will include scripture and song and the opportunity to light candles, but those gathered will steer clear of traditional Chistmas carols “because those can upset people,” Davis said. People also will be invited to come to the altar rail and pray. Davis is a trained mental health counselor who worked in hospice care before becoming ordained. Working as a pastor introduced her to “a multitude of new tools, ways to get people in touch with their feelings,” she said. “I believe that anytime people come together in worship, it can be a time that God can touch their hearts in a way that provides healing and reconciliation,” Davis said. Davis said the service at Manatee will be based on resources offered by the United Methodist General Board of Discipleship but tailored to her congregation. Pope said he plans to modify an Episcopal Church service he found through research. Both services will include lighting four candles, one at a time, and participants will be invited to remember their loss and acknowledge the pain. The final candle will signify faith and hope. “It’s a sign of hope that the Christmas story brings us and remembering that God shared His life with us to relieve our pain,” Pope said. At St. Paul’s, participants will then be invited to light their own candle and kneel at the altar to pray or meditate. They will be invited to leave the candle there to burn out, Pope said.